Back when I was studying, my cousin had a habit of cooking up snacks to prep me for my exams. Then, she would knock on my door (occasionally shocked to see the state of my well-being) and wish me "all the best". Hours later, as I walk out the exam hall, I would receive an enthusiastic message from her asking how i did. As time goes, I started to miss these little things. So, I'll be passing on this sweet habit to all of you. This cake is a tribute to examinees, particularly those who are "winging" it and those who are caught dancing to Billy Jean with a neon colored head band and drum sticks made of crumpled lecture notes (definitely not me). Its a simple Breakfast cake. Not too sweet or sour, not too dense or light. Perfect for exams and fricking delicious. Recipe from Yudith's website over at Blissfully Delicious. 1. Preheat oven to 350F/175C. Line and butter 8" cake pan. 2. Cream butter and 100 g of sugar until fluffy and light. About 2 minutes. Add the egg and vanilla. Beat for 1 minute. Set aside. 3. Add 30g of flour to the grapes. In a separate bowl, combine the remaining flour, corn flour, baking powder, soda and salt together. 4. Add the flour mixture into the egg batter in 4 additions, alternating with buttermilk in 3 additions. Stir just enough to combine. 6. Bake at 350F/175C for 45 minutes or until a skewer inserted comes out clean. Let cool in the pan for 10 minutes before turning it out on the rack. Serve. This cake tastes and smells amazing. And it's perfect when you have soft grapes in the fridge. Soft, moist yet crumbly and has a sugar crust to-die-for, TO DIE FOR! Wow, I love the crusty look of the top and very moist and soft inside. Beautiful cake! @ wok with ray: When I cut into it, the crackles of the crust shocked me. I would have added more grapes the next time. I'm so glad I don't have to take exams any more...but if I did I know exactly what I'd want someone to make for me :-) This looks gorgeous - love the crusty sugar top. Mmmm you mean I CAN have cake for breakfast?? Yes please! This looks so good. Wow is that for real, that's a MUST try! Lovely photos! I have never used grapes in baking - this looks really delicious! I'm going to bake with grapes sometime soon. This is a habit worth passing on...I was a pre-med student in college and I totally can relate to the dancing with crumpled sheets of neon paper...This looks like a really really delicious treat. Thanks! @ monsterscircus: Thank you! It is a must try! @ Amy: This is my first time too! I researched and saw that "grapes cakes" aren't that rare. Grapes! In cake! I'll bet it's really delicious and moist. Good luck getting through all of your finals and summer is waiting just around the corner. @ Joanna: There can never be too many cakes in the world. Agreed? @ Sarah: It's really good. If it weren't for the color, i would have said it's even better than blueberries. @ WokandSpoon: Oh! Perfect! I had ripen grapes too! :D Let's have that diet together "someday". I love grapes in any kind of baked goods! This looks wonderful - and I think breakfast is the perfect time for it. ;-) Super recipe - thanks. very nice, i've never had a grapes cake.. ever. never even thought it was possible.. very creative recipe. i love simple cakes that go well with a cup of tea or coffee. @ Honey: I didn't think it was possible too! Can you believe it?! This cake goes well with anything, really! I've never had grapes in a baked version before...what a fabulous idea. This looks delicious! @ Ameena: I would have thought of it if it didn't seem impossible too :D Thank you! Bwahaha @ dancing to Billy Jean! You are too funny! :D I've only recently discovered how good grapes are when you bake with them. I love how they get all soft and sweet--this looks so yummy! @ Kiersten: Aw, but its "BillY Jean, like my lover!..~" oops They are! And they turn out juicy and purple! I LOVE this!!! I am so going to make this oh so delicious cake! I tried a cake with grapes before, and it was really good but I forgot about it. Thank you for reminding me and sharing this recipe. I am excited!! 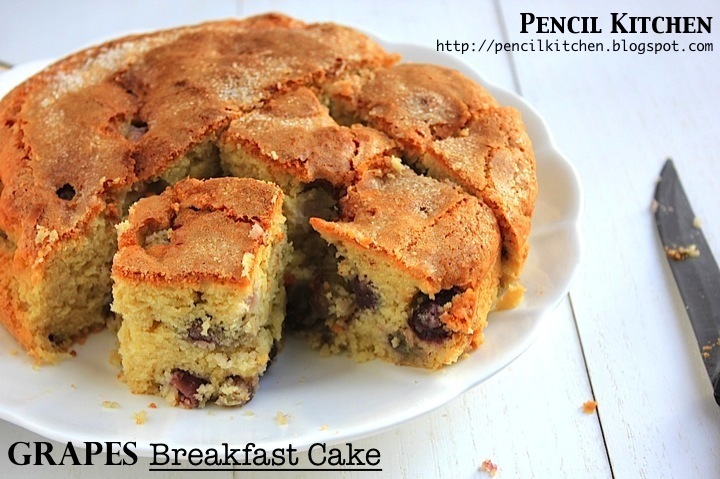 Your breakfast cake is truly scrumptious and delicious. The photo looks great! I love the story with this! Exams are horrible, I'm back taking courses now and I still get all frazzled! This breakfast cake looks fantastic! I'm adding it to my list of recipes to make. 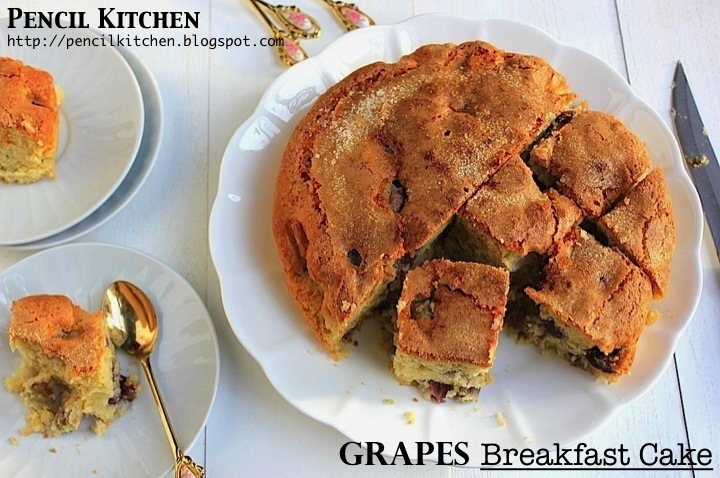 The golden, sugar-sprinkled top looks so good, and I love the grapes in the cake! I'd love to wake up to this for breakfast. @ Lisa: It does doesn't it! 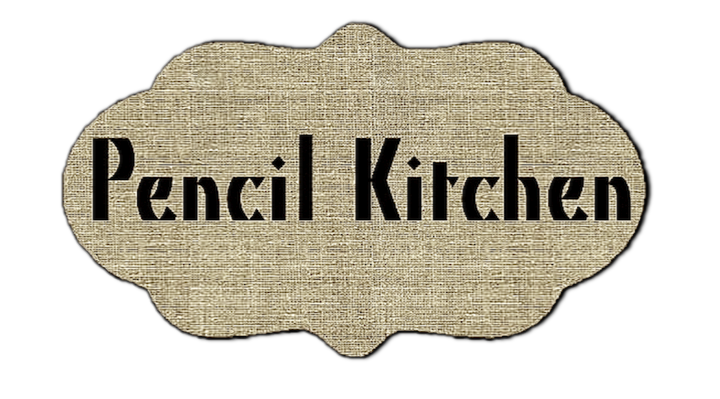 I was in love as i jabbed the knife into its crackled top and the crisped top sang. How creative is this?! I would never think of baking with grapes...love discovering stuff like this. @ Clair: Thank you! Discovering is a part of life! Life may be short - have your desert first, a little card said in a Las Vegas restaurant. So right!!! I've never tried anything like this! I will definitely have to change that. It looks scrumptious. I really like your blog and your creative ideas. I also like and use corn flour in tarts. After your grape cake recipe, I will use corn flour in breakfast cakes too. With my best wishes, I am from Turkey, PIRIL. i would love to try it... it sure looks good. Dear Jesoca - Few things I love more than Grapes In A Cake! Yours looks just too marvelous for words and I could chow this down morning, noon and nite! Good luck with your finals and welcome to summer fun very soon! @ Maggie: This was my first try with grapes too! The colors and the taste, not to mention the low-cost. My cousin was one of those indeed! And her gyouza dumplings are to die for. @ Devaki: Although I do not have finals but those who do would be fighting for luck :D I remember those days, crossing all the fingers i have so that the questions in the papers are the ones i studied for. Ahh, those horrible days..
grapes simply don't get enough love from the baker set. great cake! @ grace: Agreed! They are too little appreciated..
@ Jo: I adore grapes too! Unfortunately, grape juice in cans were all i ever tasted. And they're my favourite flavour! Absolutely awesome recipe, wow! 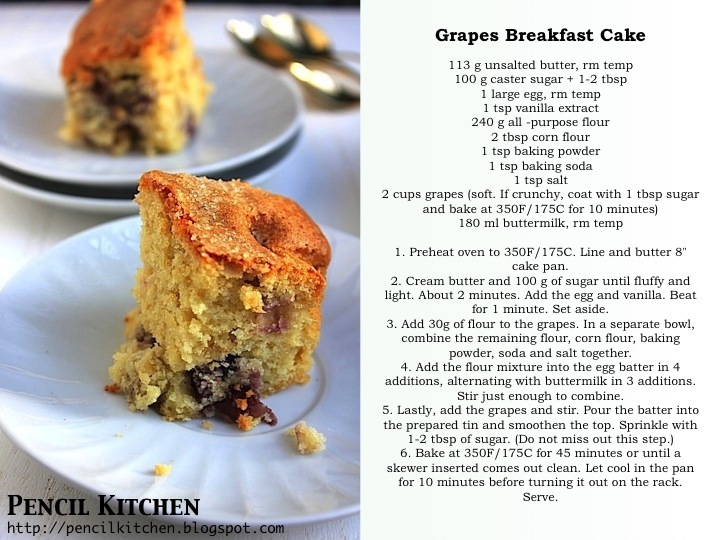 I'd love to have grapes breakfast cake every morning!! 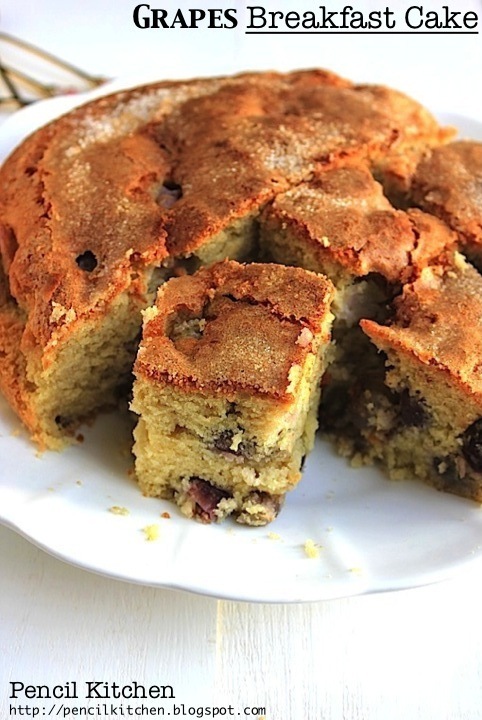 I have many cakes with raisins but I never thought to add grapes. How yummy and moist and I am sure it would not last long in my house. @ bam: It wouldn't last long indeed! :D They're addictive..